Associated Terminals (AT) is a major cargo handling and logistical solutions company, which operates terminal facilities on the Lower Mississippi River. The company offers dry bulk and breakbulk cargo shippers an extensive range of services, including the total co-ordination of movements to provide customers with a comprehensive transportation and stevedoring package. AT is the only provider in the Lower Mississippi area that is able to offer mid-stream as well as land-based cargo handling, as well as all modes of transportation. It can handle all types of cargo — general, bulk, and breakbulk — at all of its facilities. Founded in 1990, AT’s operational bases include Myrtle Grove, Chalmette, Reserve, Convent and Port Allen, Louisiana. Over the years, it has continually expanded its capabilities, assets and geographical locations to meet the growing needs of its customers. strategic alliance established between AT and St. James Technologies. Todd Fuller, the President of Associated Terminals, has taken the time to give Dry Cargo International details of what this acquisition really means to the company. coupled with the land-based storage facilities that AT already held before the acquisition, together with its ability to load railroads and to use any means of transport, this means that AT is a real force to be reckoned with on the Lower Mississippi. innovations. One of the major innovations that SJ Tech introduced is its Harbor Telematics Crane Data System. This cloud-based information service specializes in the logistics needs of mobile harbour crane users. Data is collected in real time, and relayed live to the operators’ computers. This means that instant feedback is available on what each crane achieves, from hour to hour, including details on its swing cycles, tonnages handled and more. The Harbor Telematics system also provides vital information relating to any operational problems, and can even predict failures and other issues with parts and equipment. This means that it is possible to schedule maintenance and/or repairs at times that are operationally convenient, and prevent costly failures. AT always carries a wide range of spare parts, to allow it to respond swiftly and efficiently to any issues that arise. 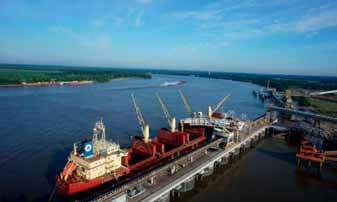 Associated Terminals owns and operates an intermodal terminal in the Greater Baton Rouge area. Located on the Intracoastal Canal in Port Allen at mile post 229 A.H.P., this facility is focused on the efficient transfer of cargo between barge, truck and warehouse storage. The site has more than 45,000 square feet of warehouse storage and 130,000 square feet of outside storage. Each location offers its own cost advantage. Ocean freight, for example, is better served lower on the river because of the proximity of the ocean; further up-river, there are opportunities with barge lines. Up-river locations offer major hubs and turning areas for barges, so shippers can benefit from great freight advantages when arranging inland transportation. Fuller explained that AT has a strong focus on customer satisfaction. The company takes great pride in having assembled a team of hardworking professionals who are truly dedicated to helping its customers succeed. As such, AT is focused on handling each job, each tonne and each business opportunity in a manner that exceeds the expectations of customers. AT’s success in this is evidenced by its stable customer base. The SJS acquisition — though only of assets — has also opened up opportunities to increase AT’s customer base, and the company is taking full advantage of this and has already brought in some new clients. senior staff. This brings its staffing total to close to 600 employees. On occasion, AT is called on to assist customers who have a sudden need — for example, those dealing with equipment breakdowns on the Gulf Coast. Here, because it has such a large fleet of (14) floating cranes, it is often able to send one or more of its cranes to carry out work at short notice. quickly from carbon-based cargoes, to fertilizers, to alloys and pig iron and more. AT is even able to handle containers when the need arises, and is also able to feed bulk products into containers, though demand for this service is not high right now. AT is currently working on growing its business, and is starting to integrate further inland than just the Mississippi River. It seeks to meet the needs of customers who need expertise in technology and material handling, and to find opportunities to handle cargo at the customer’s own facilities. If this ties in to the Lower Mississippi, AT will work to bring those opportunities together. So while its focus remains on the Lower Mississippi River, it is also looking at other opportunities. AT expects the SJS acquisition to help it to grow its brand and customer base. The company already handles a staggering amount of cargo every year. In 2011, it handled 21mt (million tonnes); 2012 was a record year with 24mt; in 2013 the total was nearly 20mt; and in 2014 it was 20mt. Fuller says that, further to the SJS agreement, AT should exceed 25mt in 2015 handling all types of cargo. AT is always eyeing opportunities on the market, and has several prospects on the horizon. If these should all come to fruition, the company will happily expand its already large fleet of floating cranes. Port Corpus Christi, located on the Texas Gulf, is the fifth-largest port in the United States in total tonnage, and offers shippers a profitable alternative to the crowded roads of trade. With Eagle Ford Shale activity a short 50 miles from the port, many of today’s projects stem from low natural gas prices. A record $32 billion in investments is taking place at the port, and much of that is dedicated to dock and rail improvements. The Nueces River Rail Yard project recently opened Phase I, a $17.8 million construction, utilizing $10 million from a Texas Department of Transportation TIGER Grant. The new rail interchange consists of four parallel ladder tracks for a total yard capacity of 15,300 feet and 253 rail cars, greatly improving the efficiency of existing cargo movement, such as grain, petcoke, and heavy project cargo such as wind components. Wind continues to blow in the right direction for Port Corpus Christi making it the #1 port of choice for import/export wind energy cargo in the Gulf. In 2006, the first major wind manufacturer discovered Port Corpus Christi’s infrastructure and capabilities to handle wind components: from the well-equipped general cargo docks to the proximity of highway transportation and rail access, the elements of the logistics chain were in place and ready to serve. Since then, the Port’s wind customer portfolio has grown to include all top worldwide wind manufacturers. The future of wind cargo through Port Corpus Christi is foreseen as quite promising in spite of uncertainties due to the Production Tax Credit (PTC), which allows for a 2.2 cent per kilowatt-hour tax incentive for renewable energy for ten years.A U.S. Department of Energy report shows wind energy can double within the next five years to supply 10% of electricity by 2020, 20% by 2030 and 35% by 2050. Another positive variable for Corpus Christi is the Texas ‘wind rush’, currently at its height, with 7,500MW of wind projects currently under construction — more than all other states combined. Each MW of power can sustain an average of 200 typical homes at peak time. Proximity to job sites; adequate yard space to position the large components for import/export operations; a high level of cargo security; direct access to different modes of transportation for timely deliveries; competitive rates and a skilled workforce are all components that logistics providers take into consideration during port nomination. Adjacent to the new Nueces River Rail Yard is the location for the future M&G Chemicals PTA/PET plant; the largest vertically integrated single line plant in the world.The plant is under construction and jumbo components have begun arriving at Port Corpus Christi. Direct vessel-to-rail discharge and the close proximity of the Nueces River Rail Yard to the construction site make the transfer of these massive components as efficient as possible and allow M&G to ship assembled components to the site. A new project on the Port’s La Quinta Terminal, voestalpine, and another adjacent to the property,TPCO, are both well under construction and the Port continues to receive oversized components, such as boilers and assembled structures, for completion on site. As times change, so do the types and dimensions of project cargo. The port’s forefathers could not have envisioned the need for the public docks to be equipped for components such as wind turbine generators or jumbo construction projects. However, the vision existed to create an internationally acclaimed Gulf port and, by all accounts, they were successful. Port Corpus Christi continues to target, solicit and accommodate all types of project cargo, from an array of different industries, and position itself for growth. Impala Terminals Burnside LLC has announced that it has unloaded its one millionth tonne of product just under nine months after commencing operations. Impala Terminals Burnside, located in Ascension Parish on the Lower Mississippi River, Louisiana, is a state-of-the-art bulk facility. Totally rebuilt and reopened by Impala Terminals in 2014 with over USD300 million invested to date, the facility is now receiving regular shipments of petroleum coke and coal. The terminal is well on its way to becoming one of the leading bulk logistics facilities in the US and following a proposed second phase of construction, will be the only terminal on the Mississippi River able to offer both rail-to-vessel and barge-to- vessel capability. Impala Terminal’s investment in the facility is set to continue; with a plan already in place to incorporate the latest rail unloading features such as bottom dump cars into the existing infrastructure to minimize the unloading time for all rail cargoes. This follows investment in equipment such as a Continuous Barge Unloader, which can discharge up to 5,000tph (tonnes per hour) and a Ship Loader capable of loading up to 8,000tph. Impala has demonstrated a commitment to the local community, for example, in the form of job creation, with 87 percent of new hires coming from Ascension Parish and wider Louisiana. Impala Terminals, a wholly owned subsidiary of global commodity trading firm Trafigura, currently employs over 2,100 people worldwide and has world-class experience that extends through non-ferrous concentrates, refined metals, iron ore, coal sectors, oil and oil products, general cargo and container business. Impala has over 25 terminal sites worldwide and operates in over 20 countries across China, Europe, Middle East, Africa, the US and Latin America, with over 1.3 million m2 of storage capacity. In addition, Impala Terminals owns and operates a number of key ports - including a coal terminal located in Burnside, Louisiana, USA. Impala Terminals is also completing the implementation of a multimodal logistics system along the Magdalena River, Colombia. International technology company, Kongsberg Maritime announced that it has made a major investment in Louisiana with the purchase of approximately 5.2 acres for new construction on an 82,980ft2 office and training facility. Construction on the James Business Park property located on James Drive East in St. Rose, Louisiana is scheduled to begin this spring. Celebrating 200 years in business in 2014, Norwegian conglomerate Kongsberg Gruppen, parent company of Kongsberg Maritime, has manufacturing facilities and offices in more than 25 countries. Kongsberg Maritime is a supplier of dynamic positioning systems, marine automation and control systems, subsea navigation systems and surveillance systems for all vessels and offshore facilities. Kongsberg Maritime moved its service department from Houston to Louisiana in 2003 establishing a small office in James Business Park with nine full-time employees. Growing together with local customers, the Louisiana office now has 110 employees occupying 35,000ft2 of leased office space. Kongsberg will still have its HQ for the US in Houston,TX. The company determined a need to expand its space to accommodate future growth of the service department as well as a new training facility to better serve its growing number of regional customers travelling to Houston for technical training and licensing. Kongsberg closed on the property for an undisclosed amount in mid-December 2014. The three-story Class A building will be built on approximately three acres; the remaining acreage will be reserved for future expansion. The facility will include a 3,800ft2 state-of-the-art training centre, expansive office space to accommodate the company's growing staff to service vessels and offshore facilities in the region, a project department including a lab for factory acceptance testing and a large laboratory area for internal training of Kongsberg service personnel. Kongsberg Maritime develops systems for vessels covering all aspects of automation, control, navigation, safety and dynamic positioning. Subsea solutions include single and multibeam echo sounders, AUV/underwater navigation, communication, and camera systems. Cargo worked at the Pot of New Orleans’ public docks in 2014 totalled 8.37mt (million tonnes), the highest total since 2000 and up 28% compared with the prior 12-month period. Imported steel and container cargo led the growth, as imported iron and steel rose 101.6% in the 12-month period to 3.54mt. Overall breakbulk tonnes totalled 3.76mt, up 51.7% and container tonnes topped 4.61mt, up 13.5% compared to the prior year. “It was a busy year for the port and these numbers reflect the success we’ve realized from the combined efforts of the entire port community,” said Gary LaGrange, Port President and CEO. Total port-wide cargo, which includes midstream operations, export grain and private tonnage within the port’s three-parish (county) jurisdiction also rose 27.68% to 31.05mt. Many of the port’s top commodities realized healthy gains, as well. Export poultry grew by 5.5% to 331,523 tonnes and imported bananas grew by 251% to 72,165 tonnes despite only seven weeks of cargo delivered by Chiquita Brands LLC. New shippers such as Chiquita, which returned to the port after a 40-year hiatus, and project cargo generated by the growing chemical industry, will bolster future cargo figures. “New weekly services, such as CMA CGM’s Victory Bridge Service to Europe, the return of Maersk Line’s vessels, Chiquita cargo and our new Mississippi River Intermodal Terminal will position the port for future growth,” LaGrange said. The Port of New Orleans is a deep-draught multipurpose port at the centre of the world’s busiest port system — Louisiana’s Lower Mississippi River. Connected to major inland markets and Canada via 14,500 miles of waterways, six class-1 railroads and the interstate highway system, the port is the ideal gateway for steel, project cargo, containers, coffee, natural rubber, chemicals, forest products, manufactured goods and cruising.